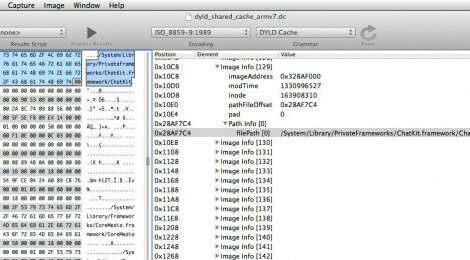 Browse: Home / iSpy – A reverse engineering framework for iOS. iSpy aims to be your one-stop-shop for reverse engineering and dynamic analysis of iOS applications. – Cycript integration; access Cycript from your browser! The current release is a developer preview; code is subject to change, and will be unstable. However, we appreciate code contributions, feature requests, and bug reports. We currently do not have binary releases, stay tuned! 1. Once iSpy is installed onto your device open the Settings application and you should see a new entry for iSpy. Enable the iSpy Global On/Off if it is disabled. From this panel you can also enable hooks for SSL Certificate Pinning, change web server settings, and optional features. 2. From here go to Select Target Apps and enable the switch for whichever applications you want to inject iSpy into. 3. Open any of the selected applications and you should see a Showtime overlay message in the upper right as the application loads, this indicates that iSpy was successfully injected into the process. 4. Open your browser and go to http://<iPad IP Address>:31337, note that the default port is 31337 but can be optionally changed in the iOS Settings. If iSpy fails to bind to the desired port it will increment the port number until it successfully finds an unbound port to use; you can see this activity in the Xcode console. We also recommend forwarding your TCP connections over USB using the iPhone Data Protection Suite’s tcprelay.sh script. Follow this guide to setup Theos and Ldid. Next we need to build the CocoaHTTPServer dependency, this step is optional as a binary is included with the main iSpy repo. This will create a new CocoaHTTPServer.a file in the iSpy/libs directory. It means you need to install the Debian package manager. I use Brew, so it was just a case of running brew install dpkg to get up and running. ← BeEF version 0.4.5.1-alpha released : is short for The Browser Exploitation Framework.